One of the benefits of being an immigrant is being able to call two countries home: the land where I was born and raised, and the one in which I live. Far from being torn between two places, each holds its exclusive spot in my heart, and neither can take the place of the other. When I go “back home” to Trinidad & Tobago (T&T), from the instant I sit on the plane heading south, my mind leaves Canada behind. Similarly, when I return to Canada, as I sit on the plane heading north, in my mind I leave T&T behind. There is always a home to look forward to, in either direction. I spent most of November in T&T, so I had the luxury of time to take note of things that I never paid attention to before. The contrast between my two homes was apparent all the time. In November in Yellowknife it’s cold and grey, and when we switch back to Standard Time, the early darkness is exacerbated. It’s still dark until around 9am and then again around 4pm. November in T&T is full of light, but it’s one of the wettest months of the rainy season, and it rained practically every day when I was there. Whoever invented the saying “raining cats and dogs” didn’t live in T&T, where it rains elephants and hippos. In Yellowknife, usually I don’t know it’s raining unless I look outside. The climate is very dry so it doesn’t rain often, let alone heavily, but even the odd good shower can go unnoticed, because buildings insulated for warmth effectively insulate you from the sounds of life. In T&T, with the windows always open and a metal roof, it’s impossible for someone not to hear the rain. What’s more, you can see it as it approaches from the distance, and you can smell it as it hits the hot asphalt. When it comes down in torrents, it’s so loud that you have to shout to be heard, you can’t hear the TV, and you can’t hear anyone on the other side of the telephone line either. Second only to the stark contrast in temperature between my two homes, my body feels the disparity in humidity levels very keenly. 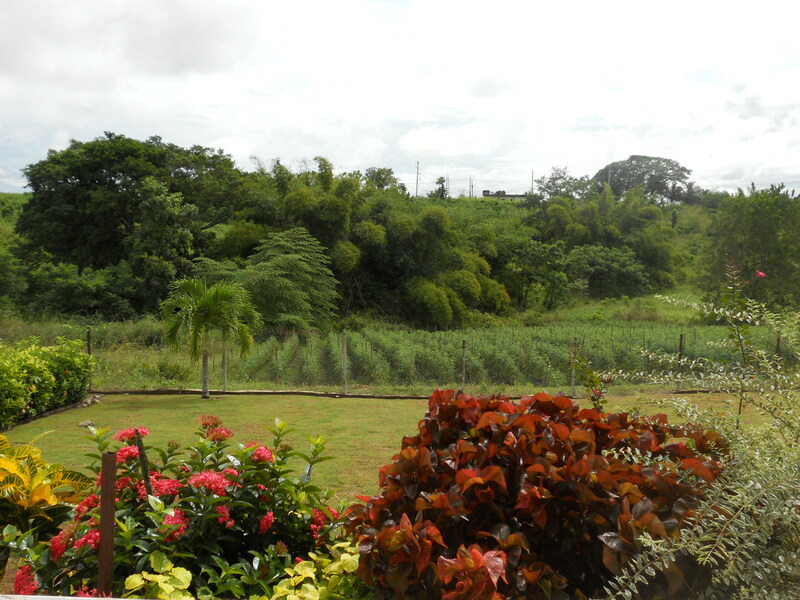 T&T is always humid, even more so during the rainy season. When I land there, even my body knows that it has come home: my hair thickens, my eyelashes come out of hiding and my skin breathes a sigh of relief as it drinks the moisture that hangs in the air. Canadians often complain about the humidity during the summer months, but my body thrives on it. In Yellowknife, I can set my humidifier to full blast, and the gauge might move only from 20% to 25%, on a good day. However, the lack of moisture in the air in Yellowknife can sometimes work in my favour: wet clothes and dishes dry very rapidly, whereas in T&T you might find your towel still wet from a shower that you took hours ago. With all of the rain and humidity, the vegetation in T&T runs away and it seems as if the bush cannot be tamed. That can hardly be said of Yellowknife, not even during the warmer months. Home in T&T is in the countryside, so while my eyes have become accustomed to the stark landscape of Yellowknife (mostly rocks and coniferous trees) they still prefer lush green and vibrant colour. An impenetrable stand of bamboo, explosions of colour on flowering poui trees and bougainvillea, neat rows of crops, rolling fields of tall grass and vestiges of sugar cane, colourful flowers and leaves on various shrubs and plants: all of these are reminders that life thrives effortlessly in constant moisture. One way to describe home is the place “where everybody knows your name”. Both T&T and Yellowknife are small enough societies that people either know you, or they know somebody whom you know. It’s rare that you even go to the grocery store and not run into someone you know. It hasn’t happened to me in Yellowknife (yet) but in T&T I can be stopped in the mall by strangers and asked if I’m related to family X, because “you look like one of them”. I seem to have one of those faces that resemble lots of people, but frequently their guess will be correct. When there are two places that you call home, you really do have to save even the mere thought of misbehaving for parts foreign and very far away. 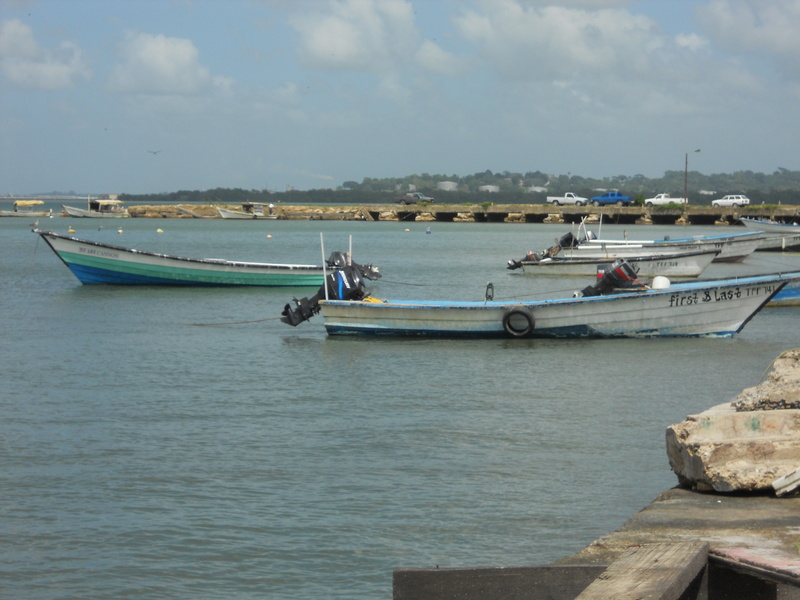 Whether you’re taking the water taxi between San Fernando and Port of Spain, or going to the beach or the river, in T&T you’re never too far from a body of water. The same can be said of Yellowknife, but mind you, in November the lakes are frozen, or at least partially so. Frame Lake is fairly shallow, so already you can take a shortcut across it to the other side of town. 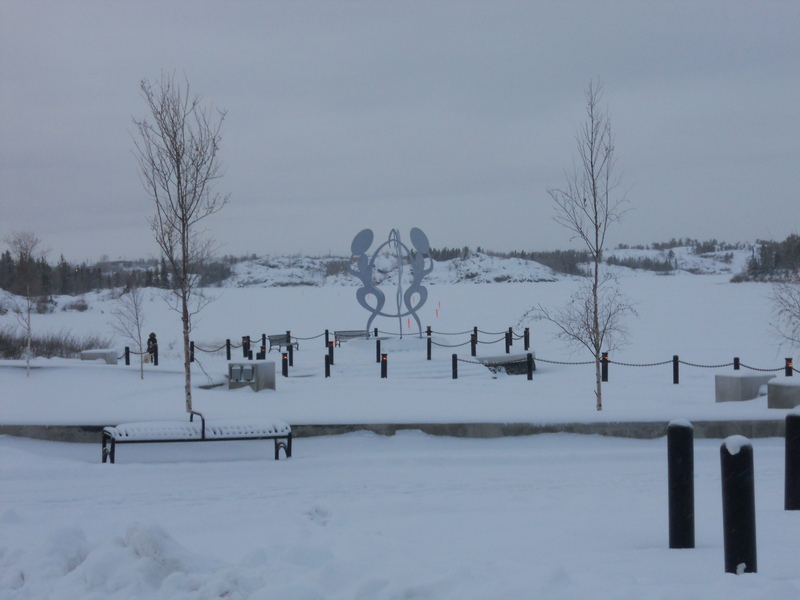 The sculpture that stands joyfully against the shimmering water during the summer now looks sad and desolate in the snow, and seems to have lost its lustre. In T&T there are fishing boats bobbing on the water at the wharf, while in Yellowknife there are houseboats sitting on the ice of the frozen Great Slave Lake. In T&T I can watch the pelicans float in the sea, and in Yellowknife I can watch the ravens puff up their feathers in the cold. The daily news, as commonplace as it is, is different between the two places. In T&T the news is about events at home and abroad, and it contains no Hollywood gossip, or tales of the idiocies of various so-called celebrities. The downside is that we have to hear all about the latest political shenanigans, corruption scandals and accusations, all of which seem to issue from a well that cannot be exhausted. When I’ve had my fill, I try escaping to the CBC, hoping for better news in my other homeland. There Rob Ford, the current Mayor of Toronto, is doing an excruciatingly unconvincing job of denying a truth that is becoming increasingly undeniable, and the federal government is trying its best to ignore the Senate expense scandal, and probably wishing that the populace would do the same. Sigh…perhaps the news is not so different after all. As the saying goes: the more things change, the more they remain the same. Somehow, politicians seem to make for a good segue into insects, with which T&T is overrun. I can leave food on the table in Yellowknife and return 2 days later to find it intact, although somewhat drier. If I were to try the same thing in T&T, within half an hour I’d discover an army of ants all over it, if not a procession of them carting it off. 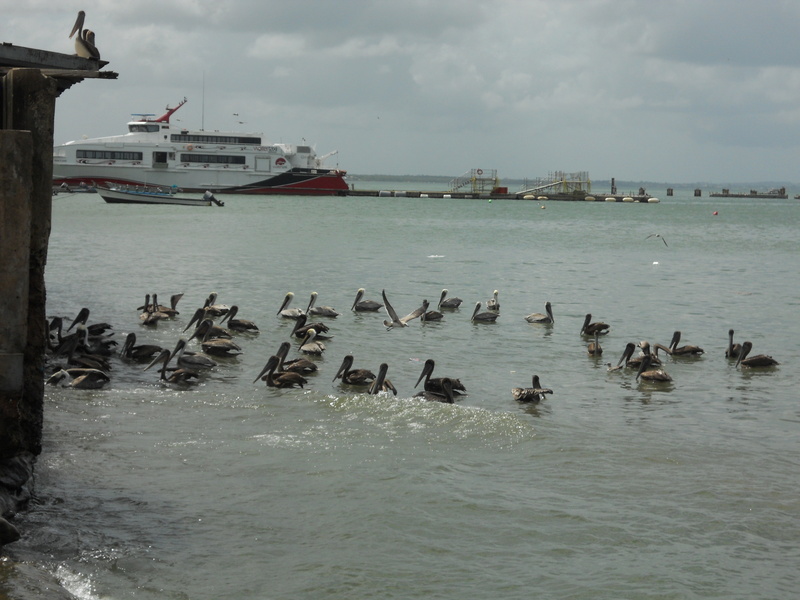 In T&T you are acutely aware that you share the planet with other creatures. During the day, formations of parakeets screech overhead, while below in the garden doves flirt, lizards scurry, bees buzz, butterflies flit and hummingbirds hover. The night is full of the sounds of frogs, crickets, owls and whichever other nocturnals are out. Some creatures have squatters’ rights in your house. Move a painting on the wall and a startled little house lizard is sure to come darting out. Leave ripe fruit uncovered in the kitchen and birds will fly in and out pecking at it. A curious bat may cruise in through one window and out through another as you’re watching the nightly news. The doorway that you walked through unencumbered last night can be covered in a full spider’s web by morning. Anyone lax enough to leave their shoes outdoors overnight had better give them a good banging before putting them on. If not, some creature may have spent the night in them, and will not be very pleased at your feet intruding on their space. By contrast, life in Yellowknife is somewhat sterile. While I can look out of the window, see a fox running by and not think anything of it, it’s easy to forget that insects and arachnids exist. During the cold months there are no insects and during the summer, the only ones I’ve encountered indoors are mosquitoes. If I’m crazy enough to leave my boots outdoors during the winter, I will suffer from frozen feet. Honestly, I’d rather endure being stung by something. I confess that I have inadvertently introduced a foreign predator. When I opened my suitcase after returning from T&T, one of those little house lizards jumped out and fled behind the nearest piece of furniture. It must have stowed away while I was packing. If it had been summertime, it could have gorged itself on mosquitoes, but good luck finding any insects to eat in Yellowknife in November! No doubt I will find its skeleton by the spring. 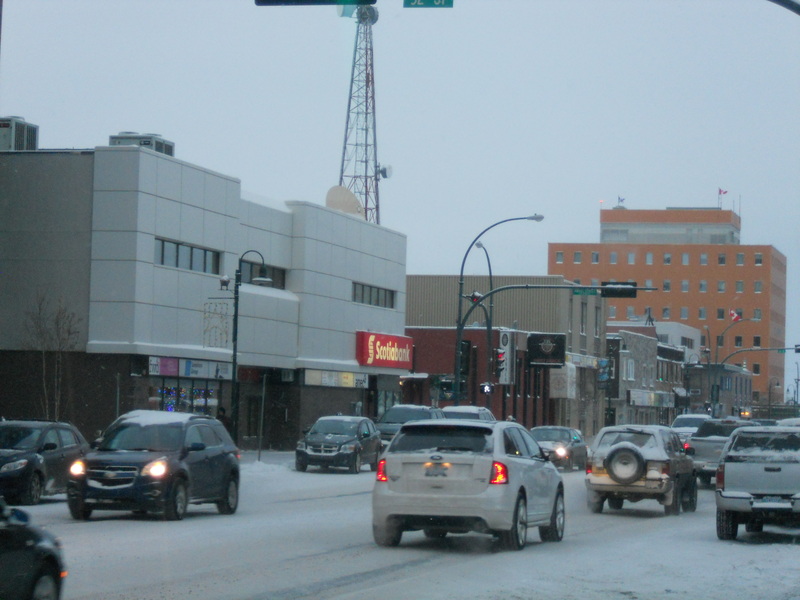 In Yellowknife in November, the dominant colour is white. The colourful playground stands out in the park, which is an expanse of snow. 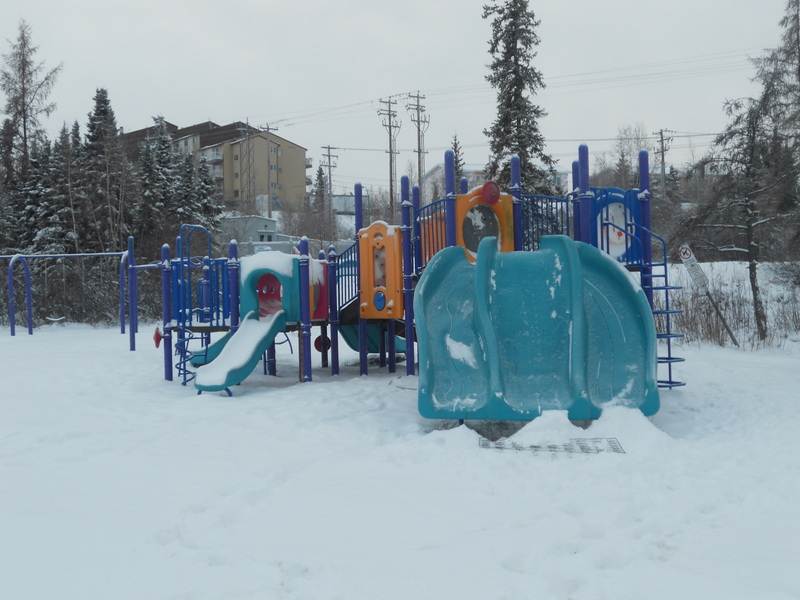 The various playground structures are covered in snow, except for the big slide, where fearless children who don’t feel cold will always play, regardless of the temperature. In town, the streets are white and the sky is grey, with only the buildings breaking up the monotony. So far, this winter has been relatively mild, so my fingers haven’t frozen while I’ve been walking around. It probably won’t last, but one can hope that the gods will be kinder this year, to compensate for last year’s absolutely brutal winter. Since my return to Yellowknife, my hair is thinner, my eyelashes have disappeared and my skin is dry, to the point where I can feel it stretching on my back as I bend over my suitcase. It’s time to get out the humidifier, because I’m finally back home, sweet home.